New research shows the mere presence of your smartphone – even if it isn’t ringing and you aren’t staring at it – undermines your ability to perform certain tasks. A team of psychologists ran a series of experiments with college students and found that their attention and problem-solving varied depending on the location of their smartphones. Their findings were published in the Journal of the Association for Consumer Research earlier this summer. For 30-year-old psychologist Adrian Ward, who led the study, it all started when he was a doctoral candidate at Harvard. Ward was having lunch at a café on Brattle Street in Cambridge when he and one of his classmates first got the idea to look into the effects of smartphones on our cognitive ability. Ward and his classmate Maarten Bos, who would become one of his co-authors in the study, wanted to know whether smart phones undermine our ability to focus even when we aren’t using them. Today, Ward teaches consumer behavior at the University of Texas Austin, where he and a research team invited more than 500 college students into a behavioral research lab and asked them to leave their iPhones or Androids in one of three places. Tasks like doing math problems and remembering verbal information at the same time. “The sort of thing you would do if you were trying to come up with a new idea or learn something new,” Ward said. What Ward’s team found was that the location of students’ smartphones significantly affects how well they perform. “Yeah, it’s pretty distracting,” said Shobha, a biomedical engineering student at Boston University. The 20-year-old says she keeps her iPhone on her desk when in the library, and she admits it’s a huge distraction. “I probably check Snapchat, Instagram every couple minutes,” she said. But some students say they don’t feel their smartphone’s gravitational pull. When Noah is studying mechanical engineering, he says his phone doesn’t bother him. Earlier: What Can Higher Ed Learn From The Latest Research On The Teen Brain? 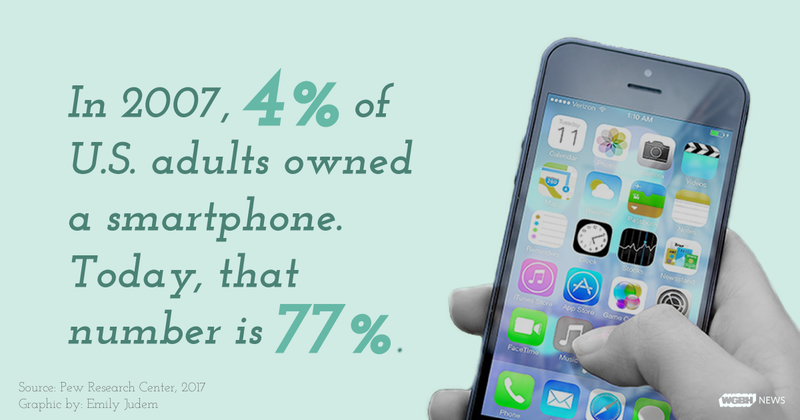 There have been recent warnings that the smartphone is destroying an entire generation. Psychologist Adrian Ward says yes, they are distracting, but the hysteria is overblown. The problem isn’t just the smartphone and its location, but also the amount of time that many college students spend on these devices and thinking about them. So if you’re trying to focus or learn something new, keeping your smartphone nearby — even if it’s off may not be so smart. WGBH News intern Nelson Reed contributed reporting to this story.